The first violin part for Mozart's Symphony No. 38 in D major, K. 504 (nicknamed the Prague Symphony) has been edited by Steven Staryk, renowned musician who has held the concertmaster position with some of the top orchestras in the world, including the Royal Philharmonic Orchestra at the age of 24 (the youngest ever), and earned the title "king of concertmasters" from The Strad magazine. Staryk's bowings, fingerings and other editorial markings have been added throughout the score. Symphony No. 38 by Mozart was composed in late 1786 and premiered in Prague on in 1787, during Mozart's first visit to the city. Although it is not certain that the symphony was actually written for Prague, Mozart was consistently popular among the Bohemians and had a devoted following in the city, and the name Prague Symphony has stayed with the piece. Download and print the score today to gain access to expertly edited Mozart Symphony No. 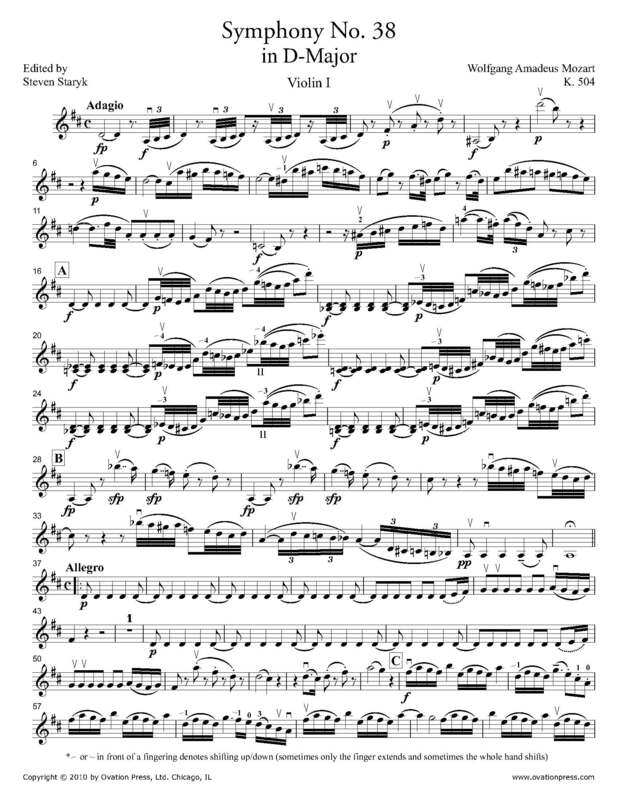 38 violin fingerings and bowings from Steven Staryk!